If there’s one thing that might be apparent, we have a slight addition to peanut butter and chocolate in our household. I’m more of a 3 parts chocolate to one part peanut butter ratio while M is the exact opposite: a lot of peanut butter with just enough chocolate to be noticed. During pregnancy, these no-bake cookies (minus the espresso) were pretty much my life saver when I was craving something chocolatey. However, I wanted to make something that was a little more easy to keep and freeze (and a bit more along M’s line of acceptable peanut butter to chocolate ratio). 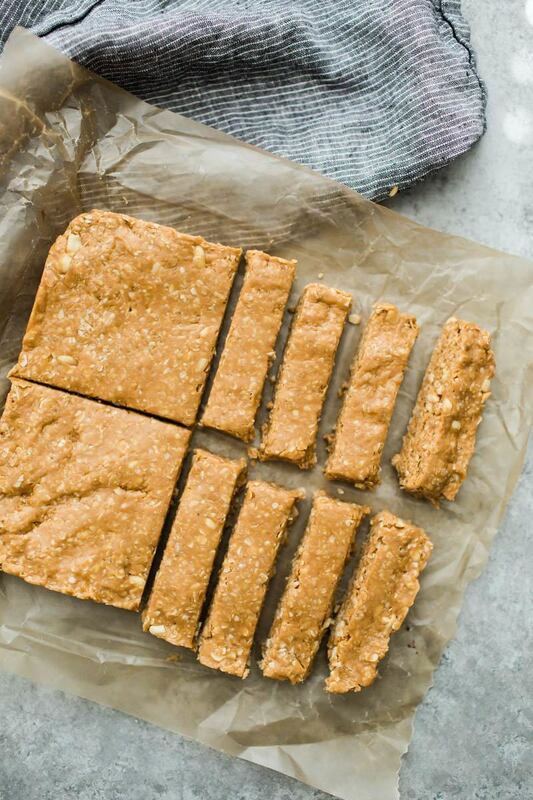 These granola bars are a culmination of granola bar recipes of past, no bake cookies, and a rice puff treat from a local co-op that’s base is peanut butter and brown rice syrup. The result is this bar that comes together easily, isn’t overly sweet, and can easily act as a satisfying dessert. I call all this information out in the notes of the recipe but I wanted to also call some of it out here. The base for these granola bars is oatmeal and it’s important you grab the right kind. We almost exclusively have rolled oats at our house but I’ve always kept a small stash of quick oats for items like these, no bake cookies, and other granola bars. 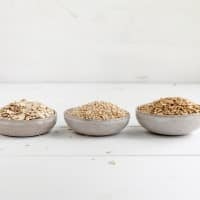 The great thing about quick oats is that they are not any less nutritious than rolled oats, they are just initially cooked a bit longer and broken into smaller pieces (I love this breakdown from the Whole Grains Council about Oats). These are ideal for no-cook granola bar recipes. However, if you want to use rolled oats, simply pulse them in a food processor or blender a few times to break them into smaller pieces. As for the peanut butter, M has an aversion to any peanut butter he has to stir and so we keep a jar of natural no-stir peanut butter. It makes this recipe a bit easier in that the consistency is always the same. If you want to use oil on top peanut butter, you might have to fudge around with the amount of peanut butter you need based on how soft (or not soft) the peanut butter happens to be that day. Finally, I think these granola bars are a great base recipe to play around with. I’ve been known to swap out some of the oats for puffed cereals (like millet, sorghum and quinoa). Switching out the peanut butter for another nut or seed butter can also be fun. This peanut version is the staple in our house but occasionally use almonds and almond butter. Heat a large skillet over medium heat. Add oats and toast, stirring occasionally, for 6 to 8 minutes. Remove from heat and place in a bowl along with the crushed peanuts. In a small sauce pan, combine the peanut butter, brown rice syrup, vanilla, and salt. Heat over medium-low heat, stirring often, until the brown rice syrup easily combines with the peanut butter, 2 to 3 minutes. Pour mixture over the oats and stir until well combined. Mixture will be a bit stiff and switching to using your hands may be easier. Line an 8×8 pan with parchment and transfer the mixture to the pan. Using extra parchment, press the mixture into an even layer. Place in the refrigerator (or freezer) and allow to cool but not freeze, roughly 30 minutes in the freezer or one hour in the refrigerator . Place chocolate in a double broiler and heat over medium-low heat until chocolate has melted, scraping the sides and bottoms of the double broiler as it melts. Keep the chocolate over the water. Remove the granola bars from the pan and cut into 16, 1″ wide and 4″ tall bars. Dip the bottom half of the granola bar in chocolate and rotate it a few times to let excess chocolate run off. Place back on the parchment paper and repeat with remaining granola bars. 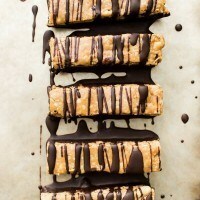 Use any remaining chocolate to drizzle on top and return granola bars to refrigerator to let chocolate set. Store leftover granola bars at room temperature for 1 to 2 days, refrigerator for 2 weeks or freeze for up to a month. + Peanut Butter: This recipe was made with no-stir peanut butter (I find the consistency to be easy to gage. However if you want to use natural, oil on top peanut butter, you might consider using a bit less depending on the consistency of the nut butter. + Brown Rice Syrup: You can swap out for honey or maple syrup if desired, but I really think these work best with brown rice syrup. + Chocolate Coating: Looking for a vegan sub that is amazing? 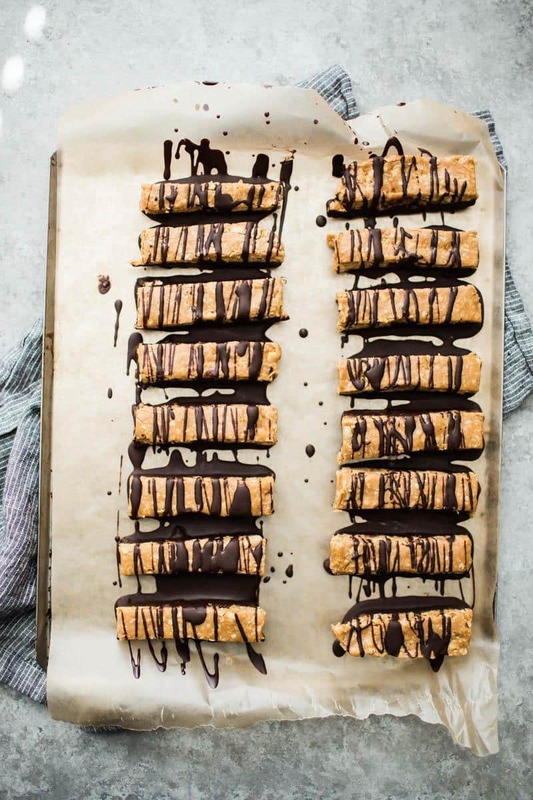 Try this chocolate coating from My New Roots using your favorite sweetener sub for honey (or just look for vegan dark chocolate). + Sub it: Make an almond version instead. 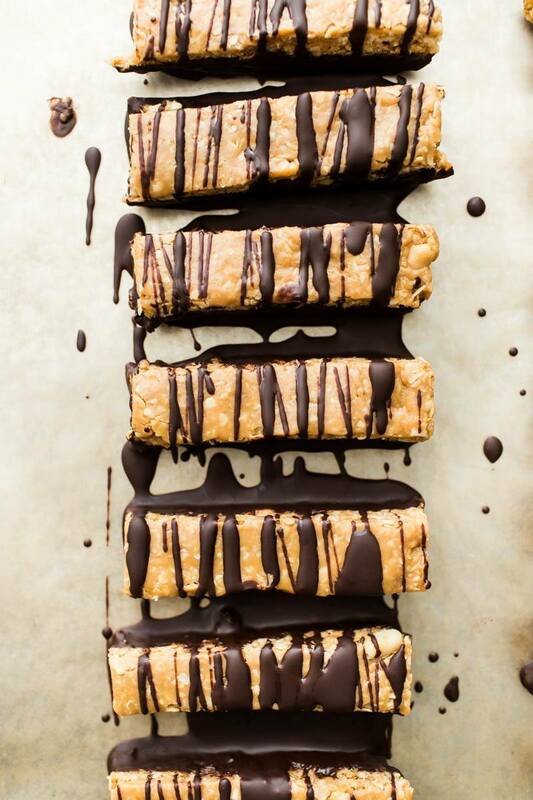 Swap out the peanuts for almond slices and almond butter for the peanut butter. They look lovely and I’m sure the taste is amazing too. Awesome first shot. Peanut butter AND peanuts AND chocolate, sign me up! These treats look as good as it sounds! 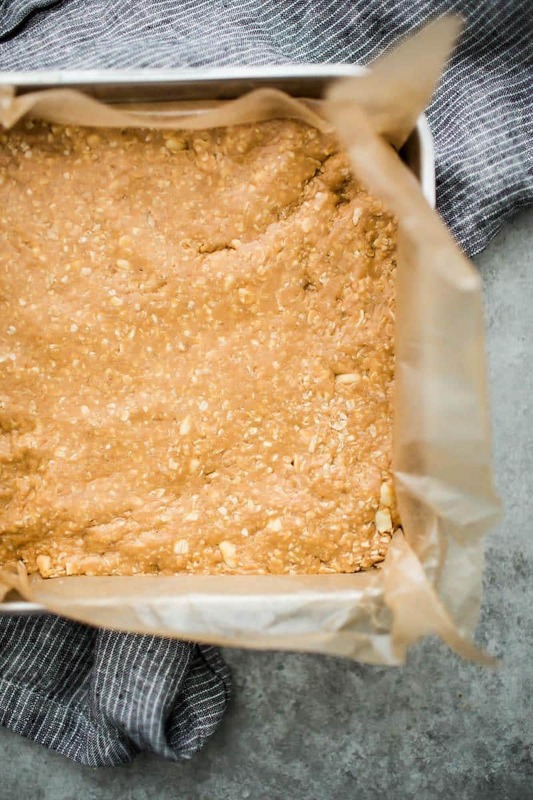 I am definitely trying this, perhaps sub half of it with almond slices just to have some variation – but I’m sure peanut would be lovely as well! Hubby has just looked over my shoulder and demanded I make these ASAP (he’s a PB addict!). Thank you for sharing! I love granola bars, especially homemade. I will definitely be trying these, they look yummy! I am 100% wowed every time a few simple, wonderful ingredients come together to make something so beautiful and DELISH! PB & chocolate together forevs <3 <3 Also, I'm a 60%-40% kinda girl, skewed toward PB. It's a separate food group in my life. Wow. This look super delicious. I am a 80%-20% person – skewed towards chocolate. I will definitely be making these. Growing up with an allergic sister, we didn’t have peanut butter in the house. Point being that it’s taken me a little while to get used to the flavor and texture of it. I’m definitely a fan… especially when in a dessert (even more so when there’s something banana thrown into the mix), so I’m all over these granola bars. Good lord. It’s 2AM and I’m craving these now. Thanks. They look delicious too. My 4 year old daughter and I made these together, and both loved the result! We added raisins and skipped the chocolate on half the batch, since she’s not a chocolate person (more chocolate for me! ), and that version was delicious too. I think I’d call these “cookies in rectangle form” rather than granola bars 😉 but we will definitely be making them again! These look great! My daughter (and I!) will love these for afternoon snacks. I just wanted to make a point on the vegan note – it’s easy to find vegan dark chocolate to use your recipe as-is. The linked chocolate coating recipe is actually NOT vegan as most vegans don’t eat honey (though I am sure it could be subbed in that recipe). Ah, missed mentioning that (as I’m usually quick to offer up a sub for honey for that reason). Added it to the directions- thanks! This is legit my new favorite granola bar! I am going to alternate between using almonds and peanuts when I make them. 🙂 Thanks for this great recipe Erin! Wow! Yum, and so, so easy. Love it! These are so good and easy to make. I used crunchy PB because I didn’t have the full amount of peanuts and I add Dark Chocolate Chips. So delicious! Thanks for sharing a recipe using Brown Rice Syrup!